Four random reviews on tap today of some stuff that's been lighting up my home screen in the last several weeks. 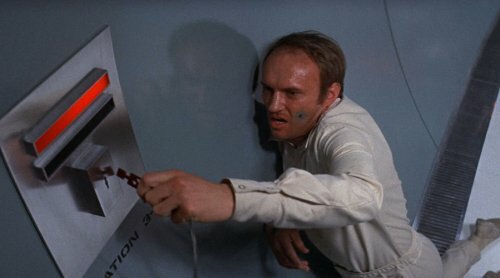 "The Andromeda Strain": Robert Wise's film version of Michael Crichton's best-selling novel remains an engrossing science fiction tale. Told realistically and soberly with a non-star cast, Wise and screenwriter Nelson Gidding create an atmosphere of scientific competence undone by arrogance and human error. 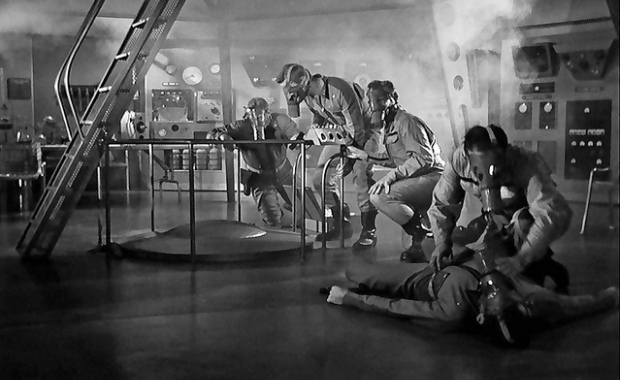 Even after multiple viewings the film still generates enormous suspense through to its climax. Universal released this on Blu-ray back in February as a Best Buy exclusive with very little fanfare, it will be available to other retailers beginning in July. The picture transfer is serviceable but might very well be the same older HD master that was created for the special edition DVD from 2003 but with the benefit of Blu-ray's higher resolution and color space. The mono audio is better than the DVD, showcasing Gil Melle's weird electronic score. Extras (duplicated from the special edition DVD) include a "Making of", a "Portrait of Michael Crichton" featurette, and the theatrical trailer. Recommended at the low price point, but not a particularly huge upgrade over the DVD. "The Frozen Dead": Dana Andrews stars in Herbert J. Leder's notorious shocker about an ex-Nazi scientist who is charged with bringing key officers of the Third Reich back to life. You see, the Nazis froze them for later revival when it appeared the war was lost. Sounds like a plan to me. Filled with repulsive imagery (at least, as much as they could get away with in 1966) including severed limbs, mutilated faces, a severed talking head, brain-damaged soldiers, lurid color, and a totally straight performance by Andrews, The Frozen Dead is a must see. That is if that sort of thing appeals to you. Beautiful High Definition stream on the Warner Archive Instant channel, also available on DVD. Recommended, but don't say you weren't warned. "It! The Terror from Beyond Space": Often cited as one of the inspirations (alongside Mario Bava's "Planet of the Vampires" and others) for "Alien", this film from 1958 takes only 69 minutes to tell almost the same story. But it's actually much more than just an inspiration. Within its obvious budgetary limitations it tells a straight-forward horror/science fiction story and layers on the suspense. Sure, the special effects are dated and the monster is effective only when kept in shadows, but director Edward L. Cahn (and who thought he would ever have a film on Blu-ray) and writer Jerome Bixby keep a good grip on the audience. Finally seen in its proper widescreen ratio, "It" looks a lot better now than it did on the old full frame TV prints and videos. The lone extra on this is a very poor looking trailer. The Blu-ray from Olive Films is a significant upgrade over the old MGM DVD and is Highly Recommended for fans, others approach with the caution reserved for low-budget and unpretentious science fiction. 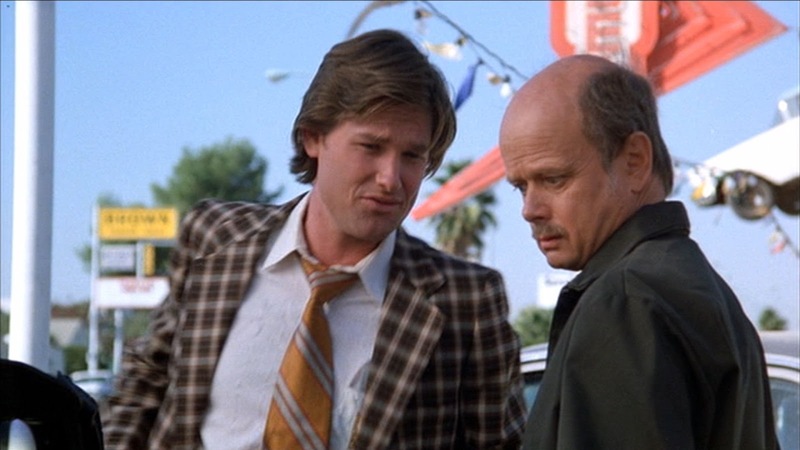 "Used Cars": Twilight Time has released this Blu-ray of the hilarious 1980 Robert Zemeckis comedy starring Kurt Russell, Jack Warden, Frank McRae, Deborah Harmon, and Gerrit Graham. Made in an era when comedies weren't forced into being politically correct, Used Cars's simplistic plot involves twin brothers, their rival used car lots, a long-estranged daughter, political shenanigans, and a scheme involving massive free - and highly illegal - television advertising. Filled with plenty of quotable moments, a bevy of lewd and crude scenes, plus a romance that is (almost) sweet, Used Cars was a cable TV staple throughout the early 1980s and is fondly remembered to this day. The Blu-ray is a stunner: wonderful 1.85 widescreen picture, solid audio (offered in both the original theatrical mono and a newly remixed 5.1 surround track) and it has a nice selection of extra features: an isolated score track, an unused score track, audio commentary with director Zemeckis, writer Bob Gale, and actor Kurt Russell, bloopers and out-takes, radio spots, trailers, and more. This Twilight Time release (available only from Screen Archives) is Highly Recommended for its fans and also lovers of non-PC comedy. You might feel a little guilty later, but you will have laughed at it while watching. "Gino! Gino! Is that you? Are you ok? Gino? Gino!" "Ggggggggggrrrrrrrrrrraaaaaaaaaaaaa!" Still one of the best "guy in a rubber suit" monster movies ever made. It does work better when you don't see too much of the monster at one time. The face looks exactly like what it is; a rubber mask. But it's a scary one and is definitely creepy in the dark. "IT" looked marvelous when it played on the big screen at a past HorrorThon at the Lafayette in Suffern in 35mm.